FAREWELLING 2015 with a bang, Dandenong City lit up its NPL1 season-finale with a 7-1 romp over Nunawading City. With Nunawading cemented to the bottom of the ladder and Dandenong City well and truly up the pointy end, it spelled chaos from the first whistle. Even with star midfielder Sean Seavill (unwell) sitting out the match Dandenong City had no trouble penetrating the Nunawading back four. City unleashed early and often as Dario Matkovic (8’) started the onslaught – working his way into open space from Erkan Filiz’s beautiful left-side run and equally precise pass – and four more goals before half time left no doubt as to the king on the day. David Di Lorio (25’, 30’, 37’, 47’) had a field day – his four-goal haul was superb and highlighted by his hat-trick goal. Di Lorio found room at the top of the box approaching the half and booted an absolute rocket into the top right corner of the net – which would have been too hard for even the NPL top brass keepers to stop. To their credit the visitors ensured a double-digit thumping was not on the cards, booting a consolation goal in the second half. The only sore spot for Dandenong City was missing its chances throughout the second half – as it powered to the front of the goals time-after-time but failed to strike as clinically as in the first 45. Getting a chance to play his youngsters, Aaron Healey threw his best juniors onto the park and the lads excelled with the taste of NPL soccer. Capping off the home-town rampage, Filiz (67’) made it a sensational six before 16-year-old striker Daniel Jurina (90+2’) came off the bench and toe-poked his second attempt in the box to give the City boys plenty to celebrate heading into the off-season.“Over the last six weeks… I think that’s five wins straight now… the effort and I suppose discipline from the players has been outstanding and to finish off the season the way we have is credit to them,” Healey said. “I don’t think it was our best performance today – played some better football and lost this year – but credit to score seven goals. The win gives Dandenong City third position in NPL1 East – with a 14-6-8 record – and Healey was pleased to finish off strongly despite a rough patch through the middle of 2015. 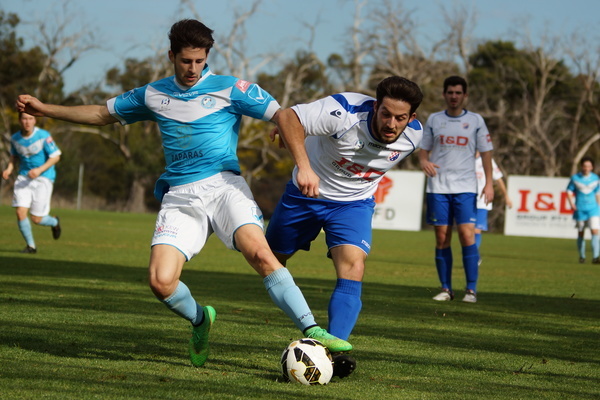 Meanwhile Springvale White Eagles was flogged 0-5 by Richmond SC in its final clash of the season. And in other results, Endeavour Hills Fire lost its State League 4 playoff against Old Camberwell Grammarians 1-2, as did Springvale City in State League 5, downed by Kings Domain.